The Movcam MM1 MB - Panasonic AG-AF100 Kit 2 With Mattebox, Follow-Focus delivers a professional mattebox, a mini follow-focus, and a lightweight support for the Panasonic AG-AF100 camera that's easy to set up and easy to use. The MM1 mattebox features two 4 x 5.65" filter holders, one of which rotates 360°. It's constructed mostly of carbon fiber to save weight, and includes one top French flag and two foldable side French flags, all matte processed for minimum reflectance. The Mini Follow-Focus MF-2 has a 0.8 gear drive, a flexible gear ring, and focus scale, and it mounts onto mini 15mm rods. 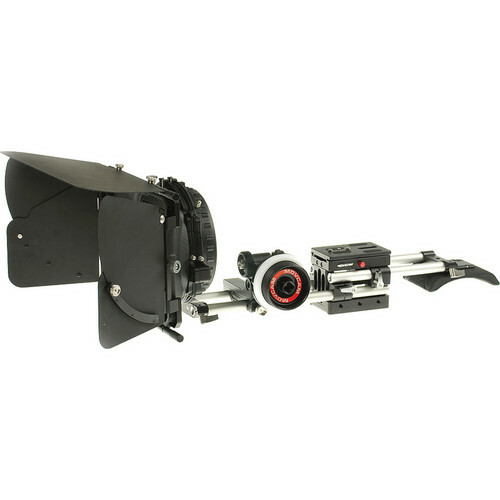 A lightweight support, a shoulder pad, a base plate, two 12-inch 15mm rods, and two 8-inch 15mm rods are also included in this kit, for a full Panasonic AG-AF100 support rig. Box Dimensions (LxWxH) 14.4 x 14.3 x 6.6"